Susan Watson, RD is interviewed by Winnipeg CBC Radio host Laurie Hoogstraten on why setting goals and resolutions can be misleading verses forming new healthy habits. She talks about instead of setting a goal to stop eating out for lunch at work, you can form a healthy habit of cooking extra food at supper and packing it up for lunch the next day. The key to forming lasting habits is to make task or habit small and easy to achieve, but meaningful enough to make a difference. 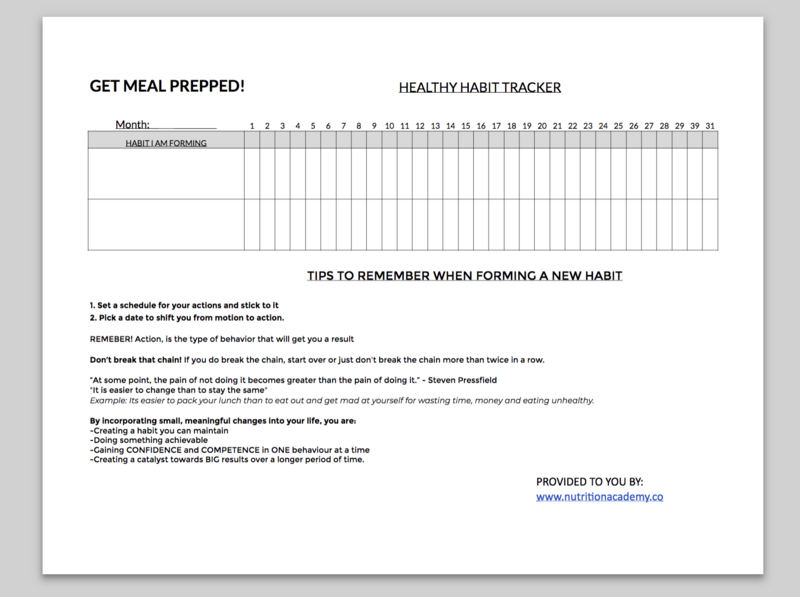 Get our Healthy Habit tracking tool and start tracking the habits you want to form! GET OUR HABIT TRACKING TOOL! Sign up and we will be deliver it right into your inbox! 2. Pick a date to shift you from motion to action. Don’t break that chain! If you do break the chain, start over or just don’t break the chain more than twice in a row. Example: It’s easier to pack your lunch than to eat out and get mad at yourself for wasting time, money and eating unhealthy. -Creating a catalyst towards BIG results over a longer period of time. HAVE ANY QUESTIONS ABOUT THE GET MEAL PREPPED™ COURSE? DROP US A LINE, WE'RE HERE TO HELP!